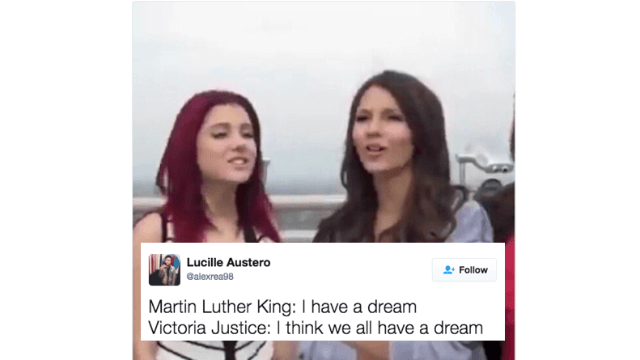 Old interview where Victoria Justice makes a petty comment to Ariana Grande is the internet's latest meme. For some reason, an old interview with the cast of Victorious, a Nickelodeon TV series that ran from 2010 to 2013, has resurfaced. You might recognize one of the stars in the series, Ariana Grande, who is now a pop superstar. It turns out that back then, before her signature ponytail, she was already a pop star in the making, singing at any chance she got. And that's what the interview is all about. The cast is speculating on which of the four girls is most likely to burst into song spontaneously, when Elizabeth Gillies, who played Jade West on the show, says that it's definitely Ariana. "One thing you don't know about Ariana Grande is that she literally sings everything. She's starting to forget how to talk in her own voice, because she sings everything. And it's a good thing, because she has a beautiful voice. But it's awesome. She sings absolutely everything. She never stops," Gillies says to the camera. The other girls chime in and agree, one saying that Gillies likes to sing, too. Then, apparently fed up with the discussion, cast member Victoria Justice jumps in and says, "I think we all sing." It's a petty moment that is hilarious probably because it's such classic teen drama, and something we have all been guilty of at one time in our lives. Sometimes, it's hard to be happy for your friend's success and unique talents. Sometimes you want someone to say that you are the good singer, or the goofball who likes to prank, or the one who is like so random. So instead of celebrating Grande, Justice cuts her down. Ariana grande: "it's my birthday on Jun-"
I think we're ALL excited that you're a meme, Victoria.